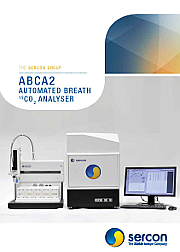 The ABCA2 is the high performance, high sample throughput isotope ratio mass spectrometer for breath analysis. The outstanding performance and versatility, combined with user friendly software, make the ABCA2 the only choice for 13C breath tests. Superior performance, high sample throughput and unlimited sample capacity ensure that this is the ultimate instrument for helicobacter pylori detection. Other demonstrated 13C applications include: fat malabsorption, pancreatic function, lactose intolerance, bile acid circulation, gastric emptying, liver function and metabolic turnover rate measurements. The ABCA2 is the high performance, high sample throughput Isotope ratio mass spectrometer for breath analysis. The outstanding performance and versatility of the ABCA2 makes it the only choice for 13C breath tests, now and in the future. Fat malabsorption, Pancreatic Function, Lactose Intolerance, Bile Acid Circulation, Gastric emptying, Liver Function and Metabolic turnover rate measurements. 13C is a non-radioactive, naturally occurring stable isotope which is used to label a specific metabolic substrate. The patient ingests and metabolises the substance , such as urea, in such a way that the 13C is released as 13CO2 and expelled in the patient’s breath. The level of 13CO2 measured in the breath is used to determine a particular metabolic disorder. The ABCA2 provides a rapid, accurate and sensitive analysis of the metabolic product so providing an unparalleled level of precision, accuracy and reliability while combining automated analysis and a highly efficient sample throughput. Based on the high performance 20-22 stable isotope analyser the ABCA2 is a fully integrated breath CO2 purification and 13C measurement system. Breath samples in convenient septum capped containers are purified by a simple permeable membrane water trap and gas chromatograph before flowing directly to the mass spectrometer analyser for measurement of 13C enrichment. The software integrated 240 position autosampler and bar code reader ensure that the whole process of measuring 13C breath tests is completely automated.